At the 2018 Hui, in his last official address as National Leader, Craig Vernall reflected on the importance of relational intelligence in our movement and how that has been fostered during his tenure in that role. What follows is an abbreviated version of his Hui presentation. 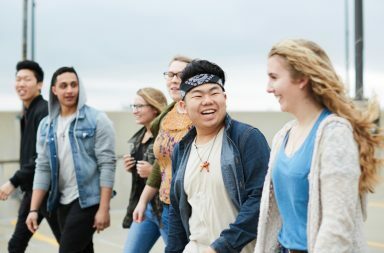 Baptists are unique inasmuch as our movement is one of church congregations, not priests. This means the local congregation is the authority within a church, with each church congregation speaking into the wider movement. Consequently, our strength will only be found within the strength of our relationships in our shared commitment to the kingdom of God and the mission of Jesus both locally and overseas. Baptists are intentionally light on doctrine. This allows for churches to interpret Scripture within their own setting. Of course, this risks potentially destroying the fabric that binds us together, but Baptist churches live within this tension. To be Baptist and to be a healthy movement requires from each of us a high level of relational intelligence (emotional IQ). Therefore, it’s important for Baptists to understand their own doctrinal positions as well as be conversant about another Baptist church’s point of difference. This allows for healthy and respectful discussion. We don’t have to agree with each other, but when we choose not to understand another’s point of view we’re left with intractable dogma. This raises the emotional temperature but doesn’t contribute to the level of relational well-being of our churches. Maybe a helpful illustration explaining relational intelligence is to reflect upon Gamaliel’s position when he was challenged about the message the disciples were spreading in Jerusalem after Pentecost. Gamaliel said, “Therefore, in the present case I advise you: Leave these men alone! Let them go! For if their purpose or activity is of human origin, it will fail. But if it is from God, you will not be able to stop these men; you will only find yourselves fighting against God” (Acts 5:38-39 NIV). So, within this framework, how does one lead a Baptist movement? Let me illustrate from my experience. Media once asked me for a comment about a social issue. It was a simple question requiring a simple, uncontroversial answer. However, within the day, one of our pastors phoned me, saying I was not the Baptist ‘pope’ and had no authority to speak on behalf of New Zealand Baptists. About two years later the same pastor rang me to ask why I hadn’t made comment on another social issue, as other church leaders had done. So, on an issue that suited his preference, he wanted me to be a pope! I got off the phone with one of those ‘you just can’t win’ grins on my face. By design, our Baptist movement is a network of relationships. These relationships are founded upon our commitment to the mission of Jesus. Therefore, the responsibility of a Baptist leader is to strengthen these relationships and to ensure that the resourcing of Baptist leaders is of the highest quality. The Baptist National Leader doesn’t carry executive authority but does have moral persuasion. I believe this is more effective in the longer term and allows the will of the churches to moderate the leader’s authority. In practice it is a safety mechanism for us all. So it was through this lens that I spent my energy as the Baptist National Leader. I was surprised at the level of disconnection that our churches claimed. The further north or south from Auckland one got the less franchised the church or pastor felt. This may be real or imagined but perception is reality. The establishment of Regional Mission Leaders (RML) who serve through Baptist regional associations has given more life and purpose to our associations. In their roles they are also connected to our ministry departments, who serve us from the National Centre. Connection is important, but mission is vital. The RMLs serve in a dual role: at times they have to retreat into conflict resolution, which we cannot avoid. However, this level of connection is a vital blood supply bringing life to our regions. The Baptist Union entered into two important relationships with Carey Baptist College. Firstly, we shared the funding for the Director of Ministry training. With Jonny Weir’s appointment we saw it necessary to have Jonny meet regularly with the Baptist ministry heads and the RMLs. This gives Jonny an up‑close connection with our churches’ ‘coalface’ concerns. This has gone a long way in helping Jonny to train pastoral leaders for the real time challenges pastors are facing. Secondly, the transfer of our Baptist pastors’ registration process to Carey has given an enormous boost to support for our pastors. The establishment of the Carey Centre for Life Long Learning has been a real win for our movement. Bringing the professional development of our church leaders under the Carey mantle will continue to strengthen our learning. The establishment of the annual LEAD conference in Lower Hutt has also helped serve the relational and training outcomes we’re looking for. We’re taking New Zealand leaders seriously and bringing local leaders in to serve us in our mission to New Zealand. We have a lot to learn from each other. In the same way, our bicultural and increasingly multicultural partnerships are becoming part of our Baptist tikanga. The Waitangi Hui in 2014 became a launch point for us to learn about, and now participate together in, a bicultural expression for our meetings. Education removes the fear of what we don’t understand. So, over the past few years we’ve heard stories about early missionary contact at Waitangi, we’ve grieved with the people of Parihaka about their loss, and have been graciously welcomed by the Rātana church. All of these encounters help us understand what it means to be the church in New Zealand. Our bicultural commitment also creates a safer place for migrant churches to become part of, because we celebrate difference and appreciate the God-given culture of different nations. Our commitment to ethnic churches has increased with the Northern Association and the Baptist Union both providing support to these new New Zealanders through Lindsay Jones and Steve Davis. New Zealand is a nation of cultural diversity. God calls our churches to reflect those in our neighbourhood. We need to embrace and make room for all the different nationalities and cultures that make up our nation and our churches. Society is changing rapidly around us. Without locking ourselves into the 20th century, Baptists need to stand firm about the centrality of Jesus. Our communities need to embrace fresh ways of telling his story. Secular humanism is not delivering on its promises. It’s a nice way to think but a horrible way to live. Therefore, our Christian communities must hold onto their purpose and be a celebration of God’s ability to transform the human heart. New Zealand Baptists are challenged by our lack of baptisms and declining attendances on Sunday. We need to take this seriously and ensure we remain true to Jesus’ mission. We all know that evangelism, discipleship and expressing the kingdom of God is what we’re called to do. So, let’s never lose heart because God will build his church. Faith in God is easier than having faith in his people. I want to challenge our Baptist family to support and endorse the younger leaders with points of difference that are growing amongst us. They need an older generation’s support in the same way that we’ve had. God believes in them and so must we. Leadership being passed from generation to generation is an opportunity for God to refresh our movement with vision and energy. Let’s pray for and endorse what God is doing. It’s been a privilege to serve and represent New Zealand Baptists as their National Leader over the past seven years. I want to thank many people who have supported me over my tenure as leader. The church family at Bethlehem have been sacrificial in their desire to fill gaps that I left. My ability to serve part-time is a credit to the maturity of many staff and leaders. I’ve also been supported and mentored by those who have gone before me—leaders who have given me time and an example of what it takes to lead, particularly leading in the vagaries of a Baptist setting. I want to give a special ‘shout out’ to the ‘473’ team who work so tirelessly to serve us—NZBMS, Carey Baptist College and the Baptist Union crew—and also to the RMLs who’ve become my co-workers to the breadth and length of our nation. Most importantly I want to thank my wife Michaela and my family for all of their support. Finally, I want to thank the Baptist family for allowing me to lead and minister amongst you over these past seven years. I’m pleased to still remain as a pastor within this family and look forward to what I trust will be a fruitful time ahead. 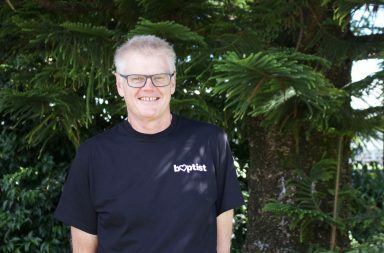 Craig is Senior Pastor of Bethlehem Baptist Church and concluded seven years’ service to the New Zealand Baptist movement as National Leader in November 2018.